How many times have you told a friend or colleague "Go to http://example.com/some/doc and search for XXXX" ? I do it a lot actually. In fact, this becomes increasingly important as the mobile web accelerates and small screens with harder-to-use keyboards become more prevalent. I would like to start creating links in my documents and blog posts that point exactly to some paragraph on the page. I hope the FXPointer Firefox extension will help. This extension gives the Firefox browser (versions 1.5-3.5. *) some basic support for XPointer syntax in the URLs. For instance, this link should send you directly to the NodeList interface section of that document. This link should take you to the first occurrence of the text 'DOMImplementation' on that page. The extension is designed to be as unobtrusive as possible. 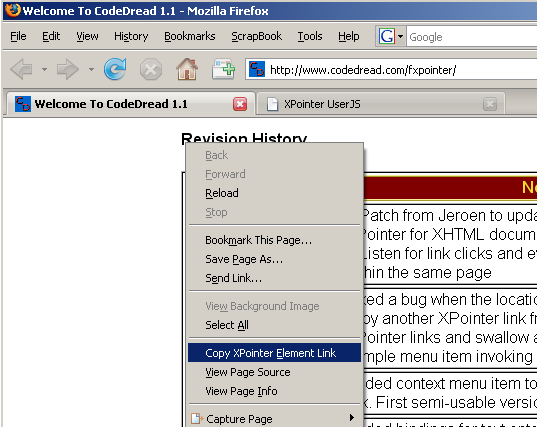 Simply right-click a point in a web page that you want to link to and select "Copy XPointer Element Link". This will copy a link to this exact point in the web page to your system clipboard. As of version 0.2.x, the FXPointer extension supports the element scheme and some of the xpointer scheme in URLs. For instance http://www.codedread.com/code.php#element(dragsvg/3/1) should take you directly to the download link for the dragsvg.js file. The extension now works for XPointer links within the current page (like this one), however it does not remember your history (pressing the Back button will not move you to the previous view). If anyone has suggestions on this, please send me an email to the address on this page. Since Bug 83830, you can now link to cells in tables. 0.2.9 2009-05-03 Updated for Firefox 3.5. 0.2.8 2008-10-30 Updated for Firefox 3.1. 0.2.7 2008-06-17 1) Ensured that fragments are unescaped so that the XPath is evaluated properly. 2) Ensure XPointer fragments are processed when urlbar text is entered. 3) Updated manifest with updateHash. 0.1.4 2007-10-30 Fixed a bug when the location bar has a hash and you copy another XPointer link from that page. Prefer shorter XPointer links and swallow any trailing 1's. Remove sample menu item invoking useless dialog box. 0.1.3 2007-10-30 Added context menu item to copy the XPointer element link. First semi-usable version. 0.1.2 2007-10-29 Added bindings for text entered into address bar and clicking Go button. Fixed other issues. 0.1.1 2007-10-24 Fix for when loading tabs in the background. 0.1 2007-10-24 Support of the element scheme in URLs.